While being a good student academically, she is also interested in extracurricular activities. She loves to participate in dancing, drawing and elocution competitions, among other things. The last time she participated in an elocution competition, her topic was - the importance of saving water. “If we stop wasting water by doing something as simple as turning our taps off properly, some of our water scarcity problems will definitely be solved,” she said. She also spoke passionately about the importance of implementing the drip irrigation system as an effective measure to minimise water usage in agriculture. Besides studies, drawing, and dancing, she also takes interest in sports; athletics in particular. 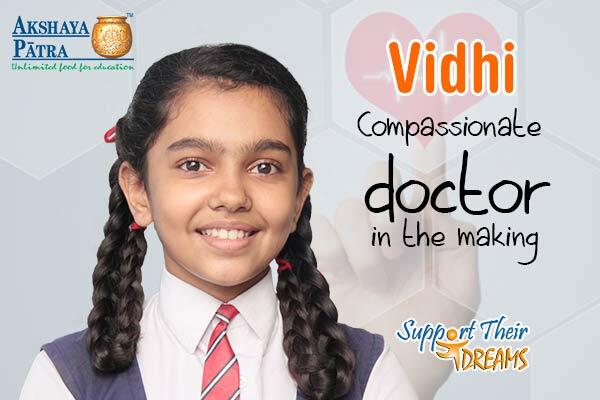 Vidhi’s father works in a mall, while her mother works as a house help. Both of them have to leave early in the morning for work, so the start of the day is very hectic for the family. In such circumstances, the assurance that their child will get food at school must be making things a lot easier for them. In fact, this rings true for most of the working parents in our country.